Leading Manufacturer of Virtual Engine Development, Multi Disciplinary System Simulation, Thermo Fluid Simulation Software, Vehicle Driveline Simulation, Multibody Dynamics Simulation Software and Avl Fire Simulation Software from Chennai. Can I calculate linear acoustic simulation without requiring additional engine data?AVL BOOST™ provides a comprehensive species transport for a high level of flexibility regarding fuel composition and working gas. This is accomplished with an internal solver for chemical reactions. Coupled with AVL FIRE™ users are able to accurately account for 3D flow and heat transfer effects in pipes, manifolds and combustion chamber. Identical modelling of physics and chemistry in aftertreatment systems empowers engineers, designers and developers to seamlessly switch between 1D and 3D models at any stage of the development phase. The flexible AVL BOOST™ 3D-approach to simulate linear acoustics delivers highly accurate solutions even in high frequency ranges. Can office models be reused in a realtime testbed environment for controller validation and component testing? Is it possible to generate physical models for the testbed without the need for test data? Can the models be used on engine, transmission, electric and chassis dyno test beds? Which combustion concepts can I analyze? How can I minimize engine-out emissions and tailor my aftertreatment system? Can I optimize the intake and EGR Systems to meet performance, fuel consumption and emission targets? Can I accurately predict flow, cavitation and erosion in low and high-pressure injection equipment? Is it possible to link nozzle flow and fuel injection modelling? Is it possible to analyze the thermal behavior of E-drivetrain components? How detailed can I investigate the electro-chemistry and electro-magnetics relevant for batteries and fuel cells such as SOFC, PEMFC, TEG, Li-ion and Li-Air batteries? Can I optimize residual stresses in structural parts resulting from heat treatment processes (e.g. cylinder head quenching) or from thermal load induced by heat release (e.g. combustion)? Am I able to calculate the flow, pressure drop and heat transfer in components of the cooling circuit considering effects of nucleate boiling? Can I use the results to predict solid temperatures, thermal stresses and deformation due to thermal load?The automatic pre-processor is able to efficiently generate grids for geometries with variable volume and/or featuring moving parts such as, pistons, valves, shafts, gears, etc. Automation shifts the otherwise significant effort required for generating a simulation model from the user to the computer. The solver utilizes a pressure based segregated solution algorithm. It incorporates implicit time discretization as well as accurate conservative and bounded differencing schemes. High-end turbulence models allow for the precise description of transient effects within an engine or on a significantly larger scale. How can I get a reliable and accurate fuel economy prediction of my vehicle concept? How can I find the optimum balance between fuel economy, emissions, performance and drive quality? Is there a tool that supports me in designing my transmission and optimizing the shifting behaviours? Is there a simulation software that generates realistic component load curves for durability analysis and component testing? What is the optimum hybridization concept for my current conventional vehicle? Can I get a complete overview about energy flow and distribution in my powertrain - from power source to wheel? Accuracy – validated for over 20 years with AVL and OEMs test data. AVL CRUISE™ supports everyday tasks in vehicle system and driveline analysis from the concept phase to control function development and testing. Its modular and open structure enables applications for different architectures (conventional, hybrid, electric) and engineering focuses (transmission, engine, electric system, controls, etc.) in all relevant industries (passenger, commercial, 2-wheeler, off road, etc.). ngine and powertrain efficiency enhancement? How to calculate airborne noise to compare with measurements?AVL EXCITE™ is used by OEMs and tier 1s to improve product performance, reliability and safety. One simulation environment for all phases of the engine development process and for all structural dynamics related analysis tasks. Shaped by AVL's 60+ years of leadership in engine and powertrain engineering consultancy. Dedicated user support and guidance teams around the world with AVL engineers who are highly experienced in engine analysis. How easy is it to generate a model? Can multiple domains be meshed simultaneously without arbitrary interface connection? Am I able to treat multiple domains in a single model? How can I handle heat transfer across multiple domains and domain interfaces? Is there a consistent material property database accessible to me? Is it possible to parameterize my model and to easily generate variants? 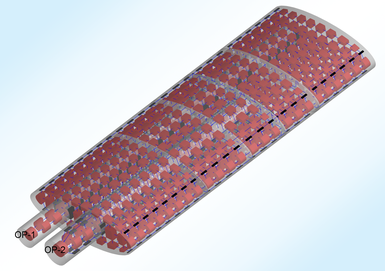 How can I analyze and judge all my simulation results?AVL FIRE™ M is the solution for optimizing performance parameters of flow-carrying elements. It also allows accurate prediction of heat transfer between fluid and structure and thermal load of solid parts. The software provides problem oriented, simple to use pre-processing solutions for geometries of all complexity levels. Multi-domain models are meshed in a single step. Domain interfaces are precisely maintained and do not require the generation of arbitrary connections. The main program is fully parallelized for maximum computing performance. Besides flow simulation, heat transfer and temperature fields in solid parts can be calculated seamlessly. Easy access to a comprehensive material property database supports users in characterizing even very complex models. AVL FIRE™ M models can be parameterized easily. Users can turn any input into a parameter. In minutes variants can be derived with the help of embedded DOE and a case explorer.